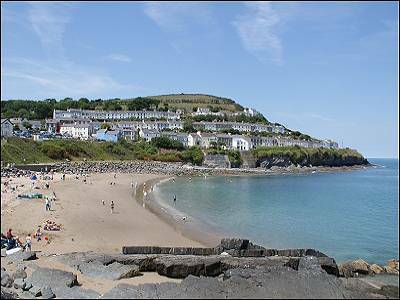 Penparc holiday Caravan, New Quay, West Wales - sleeps 4. 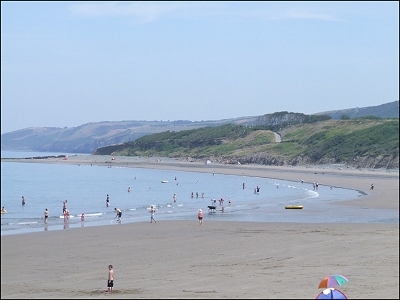 Penparc Holiday Caravan is a short walk from Traethgwyn Beach, the Cambrian Inn and just a few minutes drive out of New Quay. This two bedroom caravan is located in a separate private area of the owners very large garden. Bed linen, and all electricity and gas is included in the weekly rental of £275 to £375. One small to medium dog welcomed. Early booking advised. Accommodation - There are 2 bedrooms a double and a twin, both with built in wardrobes and cupboards and there is a fold out bed in the sitting area to sleep up to two extra if required. Bed linen is provided. There is also a travel cot. The shower/bath room has a mini bath with shower over plus WC and basin. The caravan has a new 22" flat screen TV and a dining area to seat four. The well equipped kitchen has a microwave, fridge with separate small freezer compartment and a gas cooker with oven. There is a gas fire in the sitting area and there are panel heaters in the bedrooms and bathroom. There are no additional charges for gas or electricity. The caravan has a private garden area with table and chairs. 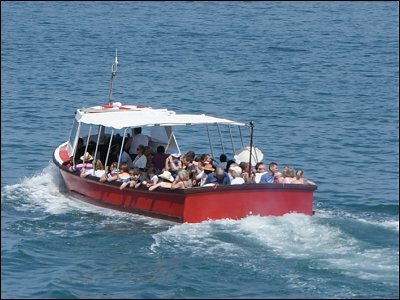 There is ample parking space, plus storage available for water sports equipment, bikes etc. There is a small stream, the 'Afon Fellen' at the edge of the garden area. One small to medium well-behaved dog welcomed. A dog should not be allowed on the furniture or in the bedrooms. No smoking inside the caravan. Weekly rentals Saturday to Saturday. Short breaks available £55 per night, 3 night minimum except school holiday weeks. Bed linen provided, but not towels. £50 deposit by card secures your holiday.